I have long said my goodbyes to cute bikinis and tank tops, as fall has already made its way to our realm. As the trees shed their leaves during this time of the year in favor of the cold weather, so must our wardrobes adapt with the changes in favor of a warmer, more bundled-up looks and cozy outfits. Among the many trendy outfits that comes out each fall season, there is one color you can never go wrong with —and, if you are like me and looking for comfortability then you understand the color black will need its own space in your closet. Black is both a color and style that goes well with everyone and almost everything, and every year, it has always been considered a chic fall trend. Black may seem plain and simple, but it states sophistication without having to try so hard. Although a lot of people believe that black usually goes with power suits and corporate attires, it can actually work for any occasion, and it provides a kind of comfortable feeling. While we all know black can be flattering, what’s best about it is that it is extremely versatile—especially when donned from head to toe or with a mix of white. That being said, you can never go wrong with wearing all-black to the office, to have lunch with your friends, or even when you go to a party. Dress it up or dress it down, you just can’t go wrong. With black, you have the freedom to mix and match varieties and styles of clothing, bags, shoes, and scarves, because you know that in the end, the black makes it all look acceptable—if not, even good. 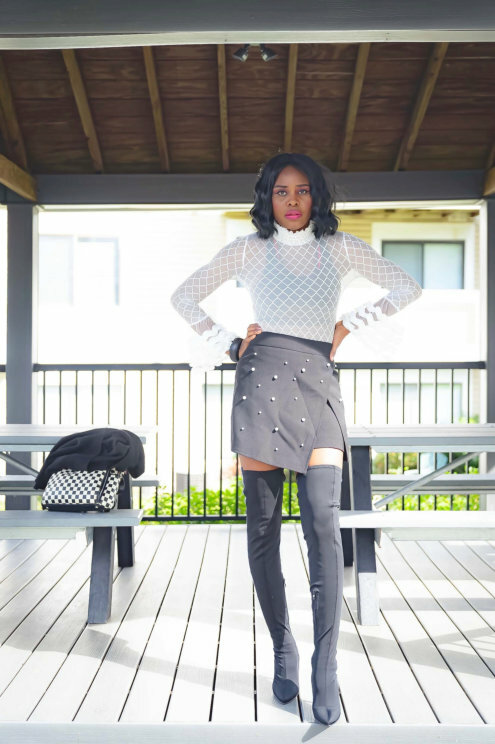 Since fall is the beginning of the cold season, but not as freezing as the winter, you can still incorporate trendy and stylish clothing such as miniskirts with over-the-tight-high boots or an open-toed heeled ankle boots, and flattering tops with warmer, more fall-suitable garments like sweaters and scarves. Since you don’t need to worry about the design and color as you are going for an all-black or mostly-black look, you can play around with what you have, or even just throw in the first black garments you see in your closet, without having to worry about creating a fashion disaster. For more tips and advice on how to remain fashion-forward in any season, while still dressing up right for the changing weather and different festivities, continue to visit Glam2Greatness. With chic fashionable styling tips, that will help you position yourself into the next dimension of greatness. Glam2Greatness is present in various channels—both in media and the real world—continuously providing fashion tips, product reviews and suggestions for the best skin, hair, and body care, and even advice on business branding and pursuing your career in the fashion and design industry. This fall, let the magic of black bring you that sense of style, comfort, and practicality, and give me the opportunity to help you soar in your respective journey to success. This entry was posted in Glam Outfit. Bookmark the permalink.